In its plans for providing a world class studio Nu Boyana has now added an underwater stage. 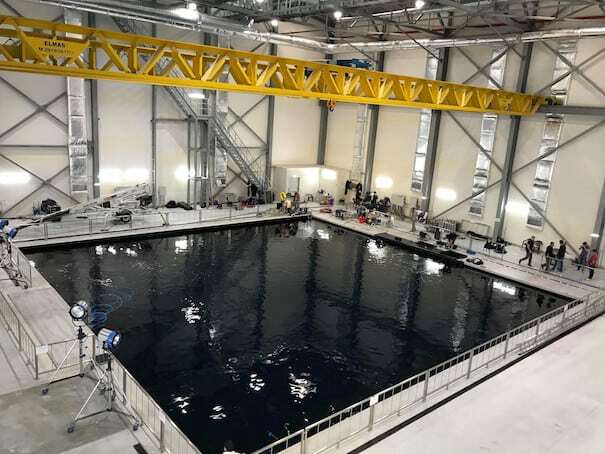 Completed in February 2018, it boasts of being the largest underwater filming facility in Europe. At a size of 20m x 20m x 6m deep, (65ft x 65ft x 20ft deep ) and a Volume of 2400m3. It has a UV filtration system reducing the use of chlorine thus reducing costume, set bleach out and actor’s eye/skin irritation. The Filtration system has a water turnover of every 6 hours and is maintained at 22C degrees with the capacity to be heated to 33C degrees if required. The viewing gallery houses a glass-viewing window of 2m by 1.5m. The tank also has a built in Skimmer system for removing surface dust and impurities. The main area has a 5m floor working area space around the tank with a 10-ton Bridge crane and 13m working height to the underside of the overhead Gantries. There are three large access doors for loading and off loading of equipment. Our underwater stage is the perfect place for planning and handling your production from the beginning to the finished result. The facility is managed by our diving/Marine coordinator Ian Creed with over 18 years experience in water movies & Commercials from The Life Aquatic, 47m Down, Star Wars, The Hitman’s Bodyguard, Rambo, Breaking Surface and many more.